Former boxing champ Tony Mundine had just one thought when his son Anthony told him he wanted to give away his NRL career to step into the ring. "When he told me he was giving away rugby league and taking up boxing I thought, 'You've got to be crazy, man'," Mundine told AAP. "But look at what he's done ... I'm very proud as a dad, also as a trainer." Almost two decades after quitting St George Illawarra to become a professional boxer, the younger Mundine is now preparing for his 57th fight against Jeff Horn in Brisbane on Friday. The 43-year-old is widely expected to lose to his younger opponent, who is on the comeback trail after his humbling defeat to Terence Crawford in the United States in June. Tony Mundine, who had a 80-15-1 record in a boxing career that included three Australian and two Commonwealth titles, is convinced Horn is walking into a trouble if he thinks his son is all washed up. "I know what he's going to do, Jeff's going to walk into a big bomb and it'll be all over," he said. When Friday's fight is over, more than likely so will be Anthony's boxing career - 18 years after he surprised his dad by telling him he would ditch the footy boots for boxing gloves. During that career there's been world titles, defeats and no end of controversial moments when his son's 'The Man' persona has stolen headlines. 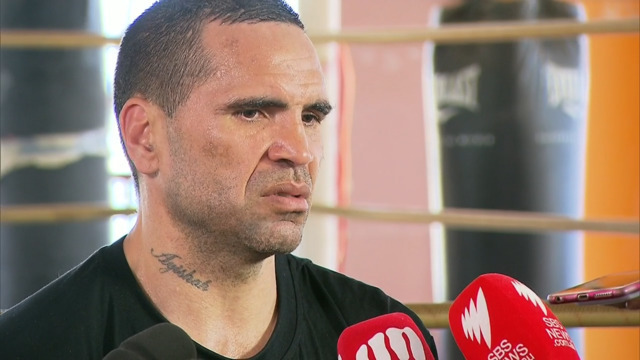 And while not everyone in Australia is an Anthony Mundine fan, his father certainly is. "He's had a great career. The 18 years have gone really fast," he said. "I'm very proud of what he's doing. If he ever got out of line I did have a talk to him and settle him down. "He's doing a lot of good work for the country and younger generations ... everything has gone really well he's just got to go out and do a job on Friday night."